Offering elegantly designed AC rooms along with a list of top-class amenities like a stunning infinity pool, air-conditioned gym and lavish massage spa, you will surely get impressed while staying at this hotel. Get ready to be thrilled by the tranquil hilltop jungle location of the hotel. You can also savour delicious dishes at the on-site restaurant KePitu. Set amidst lavish woodland, The Kayon Resort Ubud is a 5-star accommodation in the green arcadia of nature. 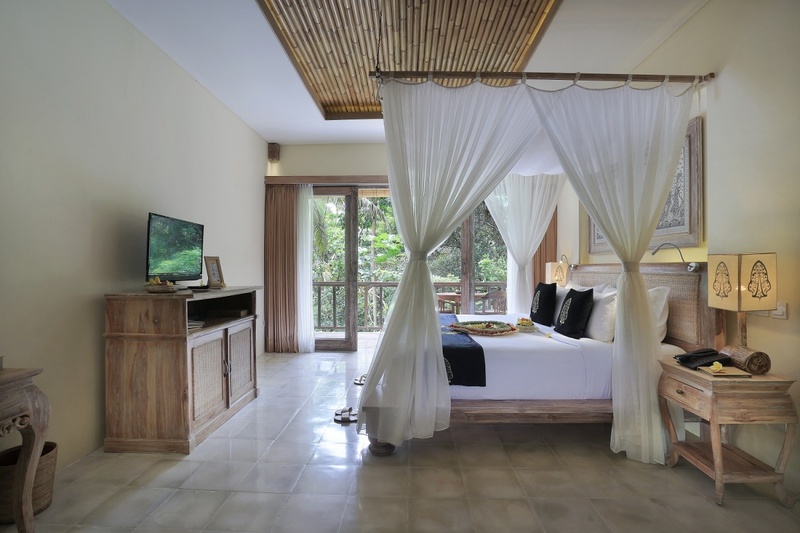 The serene ambience and sanguine vibes make it an ideal choice for accommodation in Bali. The boutique resort offers a mesmerizing view of the historical Petanu River. The adult-only hotel is a honeymooners ecstasy for creating romantic memories. The decor of the resort nuances the radiance of rich Balinese art and culture. Further, the alluring garden in the hotel titivates a refreshing impression. It swanks a beautiful swimming pool and a fitness center. Besides, a spa and wellness center is also there in the premises. The property is a 90-minutes drive from Ngurah Rai International Airport. The resort provides an airport transfer service to its guests. One can visit the nearby tourists places like Ubud Palace, Monkey Forest, Elephant Cave and Bali Zoo. Have a memorable gastronomic pleasure at the hotels in-house restaurant. Do exercise at the fitness centre and unwind at the swimming pool. Get Relaxation with a wide range of herbal spa treatments. Airport shuttle, private car rental and bicycle ride service to explore the town. Take Balinese traditional cooking classes under the mentorship of master chefs. Get rejuvenated with special yoga sessions. The Kayon Resort Ubud comprises three categories of luxurious rooms, such as Valley Deluxe Room, Kayon River Suite and River Edge Pool Villa. All the rooms are air-conditioned and connected to Wi-Fi. The rooms are featured with a large bed, wardrobe, LED TV, DVD player and electronic safe deposit. The attached toilets are featured with signature terrazzo and luxury toiletries. Other facilities in the room include tea-coffee maker, mosquito net, sofa and dining table. The rooms are featured with private balconies or terraces. The amazing view of Petanu River and the surrounding jungle can be experienced from the hotel rooms. The Kayon Resort Ubud offers a wide range of wellness therapies at Serayu Spa within the premises. Apart from this, tourists can also relax in the beautiful swimming pool. Further, guests get an opportunity to rejuvenate themselves at the specially designed Yoga Pavilion. Interestingly, traditional Balinese cooking classes by master chefs are offered to the guests in the hotel. Moreover, it offers a private car rental service to the tourists to explore Bali. Besides, one can avail the bicycle and motorbike ride offered by the hotel to get a glimpse of the local lifestyle. Furthermore, Puspaka Chapel connects the guests to the stories of the Ramayana and emanates spiritual vibes in the premises. The Kayon Resort Ubud features two in-house restaurants that offer delightful gastronomic experiences. Kepitu Restaurant serves a range of Indonesian, Balinese, Asian and Western cuisines. Moreover, it serves a range of signature cocktails to the guests. Further, one can relish the enticing food while enjoying the breathtaking view of the Petanu River at Canyon Jetty. While embracing the tranquil ambience, the guests can release all their stress and anxiety through a wide range of activities offered by The Kayon Resort Ubud. The great decor of the hotel is adorned with world-class infrastructure. All the hotel rooms are equipped with modern amenities and connected to a free Wi-Fi. It also features bars within the hotel premises for the convenience of the guests. Besides, the hotel maintains a parking area, front and travel desks and foreign exchange counters. It also offers laundry, housekeeping and medical assistance services. How much is the time taken to reach the international airport from the resort? One can reach Ngurah Rai International Airport from The Kayon Resort Ubud in 90 minutes. Does the resort offer an airport transfer service to the guests? Yes, the resort provides an airport shuttle service to its guests. How can one enjoy during the stay in the resort? The resort offers a variety of joyful activities to its guests. One can enjoy spa and beauty care sessions, work out at the gym within the hotel premises. Tourists can unwind at the swimming pool. Further, one can explore the scenic splendor of Bali by availing the bike ride. Does the resort offer any special packages for couples? Yes, the hotel provides special offers and discounts, especially for couples. Some of the packages include Wedding Package, Engagement Package, Honeymoon Package and Healing Package. One can avail these offers and packages through the official website of the resort. Situated in a verdant milieu, The Kayon Resort Ubud is an ideal place for nature enthusiasts. The hotel offers an opportunity to experience the grandeur of Mother Nature. It offers an elegant stay in a tranquil atmosphere. With a team of friendly staff, the hotel is known for its warm hospitality in Bali. The decor of the hotel is crafted in Balinese art and culture. For relaxation, a wide range of spa and wellness treatments are offered to the guests. Fitness freaks can do exercise at the gym. Also, there are opportunities for various water sports in the premises. Further, the in-house restaurant is a culinary merriment for the foodies. It serves delicious cuisines made from the locally sourced fresh ingredients. Guests are offered Balinese cooking classes and special yoga sessions. Furthermore, tourists can avail the private rental car service offered by the hotel to explore Bali. Besides, it offers motorcycle and bicycle ride to catch the tradition of the town.